If you’re having a bad day, spare a thought for two window cleaners who were left stranded on DC Tower, Austria’s tallest building. A regular day at work turned into a nightmare ordeal for two window cleaners who were left dangling precariously on the side of a 250m (820ft) skyscraper. 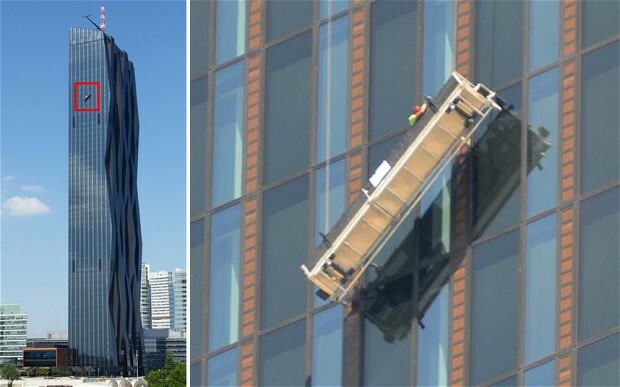 The two men were cleaning windows on the 48th floor of the DC Tower in Vienna, Austria, when their platform stalled and slipped to a 45 degree angle. These dramatic images show one of the pair clinging to the side of the window-cleaning cradle awaiting help. They were stranded more than 144m (470ft) above the ground before they were rescued from the skyscraper, which is Austria’s tallest building. A crowd gathered below the tower as around 30 firefighters secured the cradle with extra cables to prevent it from slipping further in strong winds. Both men escaped the ordeal unharmed after being directed to a ventilation shaft by emergency responders. One of them was treated for shock. It was unclear from local reports how long the men were left stranded for.